A short and breezy YouTube clip that gives a good introduction to coaching and the GROW model – with some great jazz to hurry it along. Conflict arises because of limited resources; differing goals, responsibilities and priorities; and differing ideas or interpretations. Conflict is especially difficult when it does not produce solutions and becomes personal. The goal of a manager or Coach should be to avoid “win-lose” situations and to ensure productive resolution of conflict. Effectively working through conflict results in stronger working relationships and encourages creative solutions – while handling conflict inappropriately results in damaged relationships and inhibits the expression of valuable opinions. Put yourself in the other person’s situation and imagine how you would feel and react. Look at the other side before defending your own. At the beginning of a conflict discussion, express your desire for a resolution that is acceptable to both or all of you. Restate the positions held by those on both sides of a conflict: look at it as a conflict of ideas or approaches, rather than of people. Do not lecture about why you are right. Simply state your point of view. Bring conflict into the open without feeling that your leadership is threatened. When people disagree with you, analyse the reason for their position. Ask a neutral third party to help you and the conflicting party to talk through the problem. Your HR team will always help to mediate such a situation. When a conflict situation arises, discuss it with your manager. When you have handled it, seek feedback from him or her about how successful you have been. Allow individuals to vent their anger. Venting frustration allows them to get it out in the open and allows you to work through the conflict. Clearly tell the other person the things you both agree on before dealing with their points of disagreement. This approach provides a positive starting point and builds bridges between you. If the other person feels they are losing something or that you are being unfair, listen to what the person is saying; don’t try to convince the person that he or she is wrong. Attack problems – not people. If a conflict escalates, call for a time out. Reconvene when you have both reduced your tension to a productive level and you have both regained your perspective. Instead of showing frustration, talk about it. Be willing to confront other individuals when you feel they have made an error. DP use the Thomas-Kilmann Conflict Mode Instrument. This is designed to assess an individual’s behaviour in conflict situations – situations in which the concerns of two people appear to be incompatible. You can review this model and download a PDF version to complete the questionnaire to establish your current style of managing conflict and disagreements and anise these results to assess how changes might be beneficial to you, your colleagues and your team. Click here to download a PDF version of further notes concerning the management of conflict and disagreements – and a copy of the Thomas-Killman instrument for you to complete and analyse your own style. Motivational Feedback – This usually starts with WHAT WAS GOOD…. This helps someone to understand that what he or she is doing that is working well. It reinforces positive behaviours and actions – the more specific the feedback the more likely it is that they will understand and be able to replicate ‘the good stuff’. 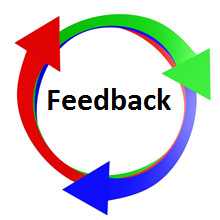 Developmental Feedback – This usually starts with WHAT WOULD MAKE IT (EVEN) BETTER…. This helps someone to understand how to change what is not working well. It contains information on what they did or said (or didn’t do or didn’t say) and what the impact was. It then offers ideas on how to do that differently in the future. The more specific the feedback, the more likely that the employee will understand and use more productive behaviours. Transforming Coaches – We want you to become the best Coach you can be. Everyone has their preferred set of coaching models, ethos and skills, – enough to fill a library, not just a book. So we thought we’d keep it simple and share 3 insights to inspire change in you, and in the people you coach: Be Present; Be Positive; Build Confidence. And now we’re going to tell you how. 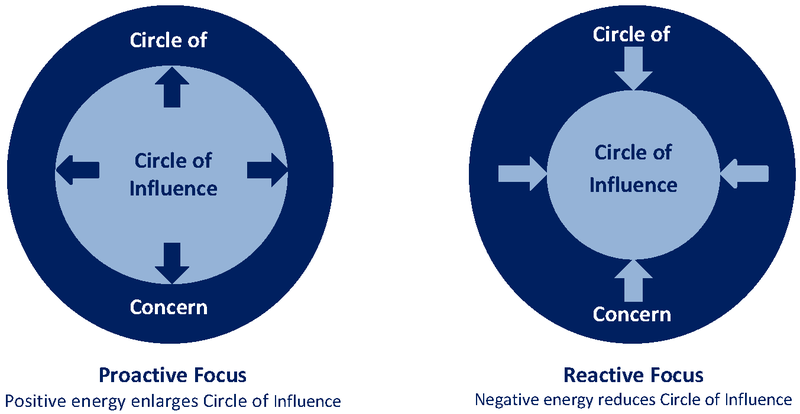 In his book the 7 Habits of Highly Effective People (1989) Covey distinguishes between proactive people – who focus on what they can do and can influence – and reactive people who focus their energy on things beyond their control. Reactive people maintain an attitude of victimisation and blame. The model is based on two circles. The first is our circle of concern. This includes a whole range of things – global warming, the state of the economy, the clothes your children want to wear, attitudes in society, the organisation you work for, the things your colleagues do, the way people drive their cars etc. The actual list will depend on the individual, but the important thing to understand is that there may be little you can do about many of these things since they are outside your influence. Devoting energy on them may be a waste of time – the equivalent of shouting at the television – and time and energy once spent cannot be reused. Our circle of influence will be much smaller. It includes the things we can do something about. The extent of this will obviously be related to your power – the President of the USA or Chair of Ford may have far more influence than you or me. The key is to focus your energy on those things that you can influence – this will enable you to make effective changes. If you do this you will find your circle of influence starts to increase – others will see you as an effective person and this will increase your power. Conversely, if all your energy goes into those things you cannot change your circle of influence will shrink. Not only will you drain your energy, other people may start to see you as unduly negative and critical. Knowing how far your circle of influence extends is an important aspect of personal effectiveness. So is forming partnerships and alliances – you may not have any direct influence over something in your Circle of Concern, but you may know other people who do. A team can have a wider circle of influence than an individual. So reactive people find their circle of influence shrinks, while proactive people find that it increases. Emotional intelligence (EI) is the ability to identify, assess, and control the emotions of oneself, of others, and of groups. This animation offers an overview of the fundamentals of emotional intelligence and their implications.